Last week I started productivity journaling. I haven’t been super consistent. Point in case, yesterday I didn't journal. And I acutely felt the loss. I feel it today. That is what struck me. That is why I’m writing this. 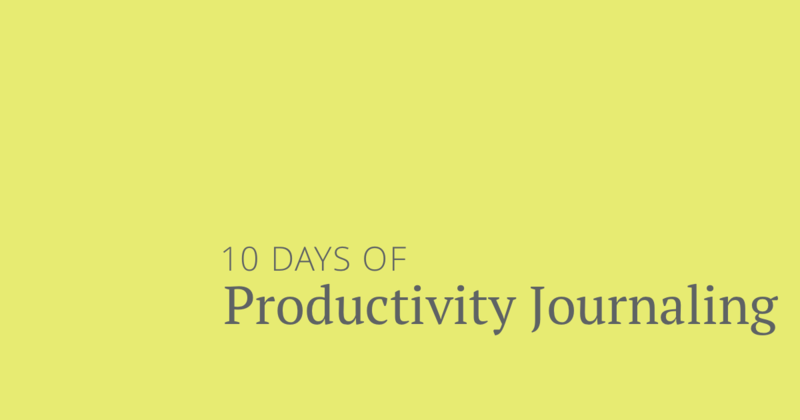 After only 10 days of productivity journaling I can feel a difference in my day when I don’t do it. Here’s how I’ve done my productivity journaling over the last 10 days. I imagine I will adjust it as I go along. At the end of each day I journal. I basically reflect on the day and how I did at accomplishing my goals. I consider if I learned anything. I include the most important things in my life in this journaling like my family. So, this isn’t just my work journal. It’s everything I am. How did my day go? And what am I going to do tomorrow? I limit the time I spend writing to no more than 15 minutes. One day I spent less than 5. I keep it simple and flexible. I just make sure to reflect on my day and plan the next day. That’s really it. I write in Day One (an iOS app). After planning my next day in my journal I put my to-do’s in Asana (limiting my goals to no more than 6 - I have to be able to remember what I am going to accomplish without looking at my list because it’s always on my mind). As part of putting together my to-do’s I prioritize them. I decide which one is most important and put that at the top and so on with each thing I plan to get done. The next day I start on the first and most important task. I don’t go to the next one until the first is accomplished. I got this from James Clear. Last night I didn’t journal. I didn’t plan my day. I didn’t set my to-do’s in Asana or prioritize them. And it affected me. It is affecting me. I woke and I felt a little lost because I wasn’t clear about what I was going to be doing today. In just the short time since I started journaling in this way I got used to running through the day of what I was going to accomplish. It was a sort of visualization. I saw myself waking up, going through my morning routine, starting on my most important task and how I was going to accomplish it. Each night and morning I would go through the whole day first at a high level of what I was going to do and then down to the tiniest of details. I even saw myself getting up and walking every hour, where I was going to walk and how it felt. Michael Phelps calls it running the tapes. He beat a world record on a swim when something went wrong with his goggles and he couldn't see. But he'd run through the tapes so many times visualizing him in this exact situation and how he would deal with it he swam at his best even though he couldn't see anything. This sort of visualization is something I've been trying to do for the last couple years. What is so surprising to me is that productivity journaling has helped me do this so much better. Another thing that has become really clear to me in this short time is that it is now Thursday. And because I haven’t been super consistent at journaling yet or very good at the process I am not clear on what I’ve accomplished this week. This is so important to me. If I don’t know what I’ve done I don’t know what I’m capable of doing. And I don’t know how much better I’m getting (or worse!). Productivity journaling seems to be really working for me and I haven’t even done it in a way I need to. That is going to change. I am going to create the habit of journaling and in the process reviewing/reflecting on my day and then my week and then month and then my year. It was this podcast that made me decide to try it, even though I had heard of the concept before. I’m going to listen to it again. It’s that good.